When i tested with “Western Digital Data LifeGuard Diagnostics” everything seems to be fine… SMART and Extended test passed “OK”. I am wondering is this warning from HD Tune is really bad one and i must replace this hard drive with new one, or everything is fine with him? Hi that error is normally associated with a bad cable or connection to the drive. Try changing the sata cable and see if it continues to go up if not that is what the problem was. I know one of my drives I noticed had 10 crc error count but after changing the cable it never went past 10. Yes… i changed the SATA cable and the data count on “C7” is still on the same value (15923). The value is also the same when the hard drive was connect on two other configuration. Hi if the error count does not get bigger after you have changed the cable that is what the problem was. And it should be fine give it a few days to see if it increases or stays the same. everything he said is solid advice. so you wanna see if its the cable causing the issue before you do anything else. THEN you may want to look into another drive etc. 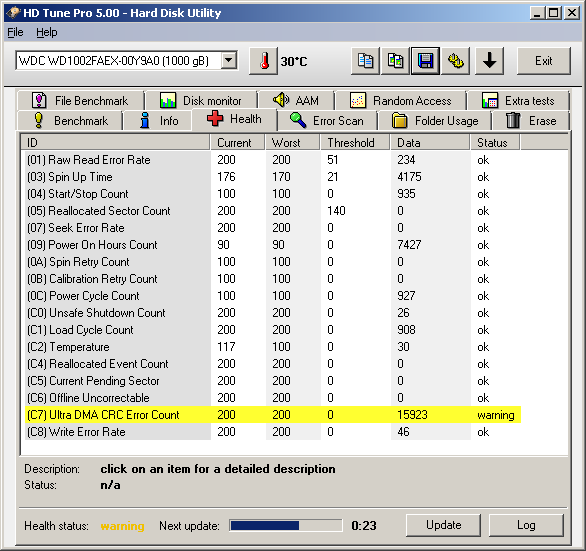 Last month i noticed a problem with a Maxtor hard drive with the same problem. And after changing the rounded ide cable to a flat cable the problem went away. Does your cable have two little bumps on the connector so it locks into place ? Some cable have those ans some don’t i think. Since that is only errors in your picture i wouldn’t be too worried yet. Thanks for your opinion… i’ll keep an eye on 01, C8 and C7. Here is some test’s which i made earlier last month and these days and you can see that the values are increasing! Also i want to mention that i changed a couple of SATA cables and also i put the drive on other configuration and the values are still there. The motherboard is clean as a glass. No dirt inside every configuration and no damage on the connectors. Other driver didn’t have problems on the same connector’s. Only this one. I know it is cheaper to change the cable’s but nothing is changing after all. Should i return this drive to the market and get a new one or everything is fine with him? The drive is one year old and i have warranty untill 2016.
we do a lot the same… my board is squeeky clean too. in other words after i was screwing with cables and cleaning the mobo etc. my Maxtor drive is old but i noticed the problem a LONG time ago and changed the cable. I hope you understand what the other guy and I were trying to tell you. i received the exact same drive you have in replacement from WD “recertified”. and read teh feedback pages on this exact drive. thats what i did when i knew what i was getting back. I would advise anyone to avoid doing an RMA as much as possible unless confident its bad. And this has nothing to do with WD i would say the same about any computer parts company. and you *may have already fixed the problem if you already reconnected the cables etc ? and you do an RMA then you will have a new drive with the same problems. Yes… i understand everything… and the message from other guy before. So… if i’m going to follow your last opinion, is this an old drive which doesn’t needed to be sold and also to use as RMA? Here is the test from [GSmartControl] which gives also valuable information about hard drives. I’ll wait as i said earlier but im worried about the drive. Hi you should never take the chance of having your files backed up to one drive only, any drive can fail at any time. If you get error reports on a drive make sure you backup your files to a different drive until you make sure that the drive with the error was confined to the sata cable only. So… if anyone knows what thеsе test’s means, please give you opinion. Hi this page lists all the smart data values and what they are for. http://www.hdsentinel.com/smart/smartattr.php Also try different test program like HD Sentinel I have had hd tune report stuff that was just not there. Second time… please leave space someone else to give an opinion from technical side. You are going in circle all the time. I have your opinion from earlier and thank you for that… now give some space for other’s to say what they have about my drive. The test’s are on the 1’st page so please look them carefull, read all the values and give an opinion from technical point of view - is this drive good or bad? Hi no need to be ignorant with me, you asked I told you you did not like my answer so carry on. Third time… i asked you to stop go in circle and telling me about cable’s and making backup. Stop writing about that!!! I have your opinion earlier and that’s it… leave space for the others and for me to carry on. Please, if anyone know to read the test’s from technical point of view give me your advice. Is this hard drive good or bad? And i want technical explanation… not writing about cables, connector’s, etc, etc… everything is done with that. The drive gives same result’s on other configuraion and the values on other parameters are increasing from time to time. other than maybe contact technical support and ask them for advice ? i doubt anyone else is going to offer any more advice than what you got already.